June FOTM Winner - Loch Awe Brown Trout! 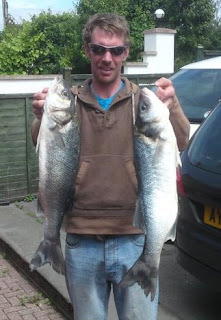 Fish of the Month June Entry - Nairn Salmon! Fish of the Month June Entry! June Clearance Lists Now Online!!! Support Macmillan and hook £1,000 prize! How to remove a fishing hook! Ben Hopkins caught these two prime Bristol Channel Sea Bass, during some rough seas on a night fishing trip. Both fish fell to crab baits and their weights were 5lb 7oz and 4lb 6oz respectively making Ben a very happy chap. If you have any problems using the online entry form, simply email your picture and details to any of the usual fishingmegastore addresses, with FOTM in the subject line!